The Mobile Experience Center of the Co-Creation Hub in Lagos, Nigeria conducted a survey series – How I Use My Phone – where they looked at phone use among university students, white collar professionals, blue collar workers and market traders*. I’ve screen-capped the section on airtime purchase patterns from each infographic to analyze a little further. *Before we proceed, an observation that the survey on traders is the smallest sample (around 50 people) and only one market, while the rest of the segments have a population sample in the thousands. Still, theirs are the most interesting patterns and to me, the most significant. I’m also hampered by the fact that each infographic is unique and every survey is not the same i.e. some show salary or income, some don’t etc – I’m mentioning this upfront and won’t refer to these discrepancies further on. Some context to set the scene: @prepaid_africa Not exactly! Most Nigerians have a daily budget of between N1000 – N2000. This covers recharge, transportation & feeding. We can see the similarities between students and blue collar workers – both on limited budgets – the majority of weekly recharges for both fall in the lowest bracket of 100 to 500 Naira, and the preferred voucher amount is 200 Naira. Most people are not topping up their mobile airtime everyday, though students are spending a bit more. Professionals are definitely adding more value to their airtime every week, and broadly speaking the preference for recharge amounts is equally split between higher and lower values. Here we can see an interesting difference after I convert these numbers into a percentage of mobile owners – 52 is the total. 20= 38% 10 = 19% 17 = 33% 4 = 8% and 1 = 2% – grossly rounded & totalling 100%. 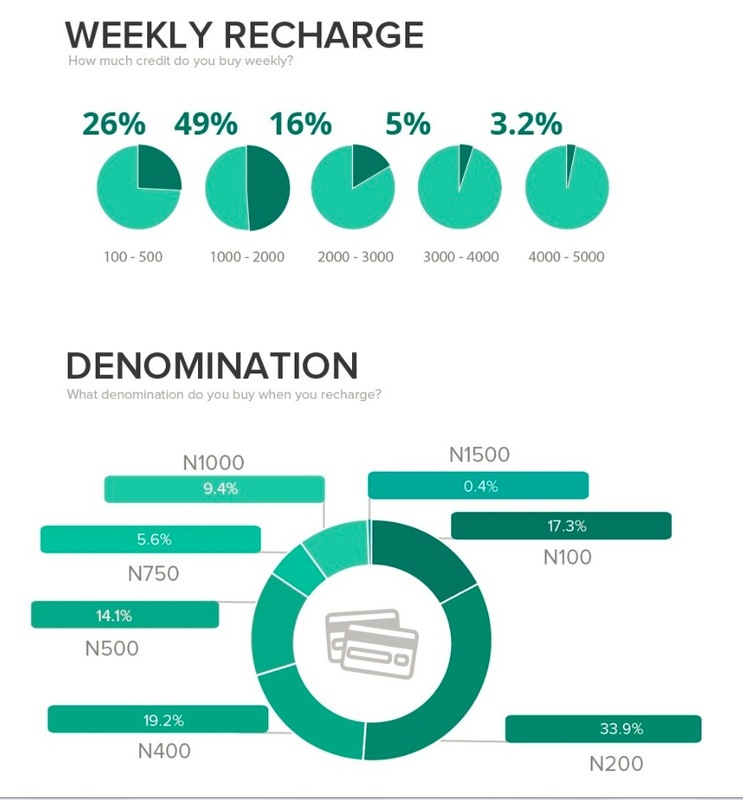 Without converting, the first thing we note is that nobody purchases recharge denomination above 200 naira and the preference is more or less equally split between the lowest two values. Even the blue collar workers had some who purchased 400 naira of airtime, while a similar percentage of students purchased amounts other than 100 or 200. We find that unlike the other segments who preferred these smaller denominations, more traders spent more each week. That is, they tended to very frequently top up with small amounts. While their total weekly purchasing pattern in terms of weekly recharge resembles the white collar professionals, their choice of denomination is significantly an outlier. Even with all the disclaimers on sample size, consistency and quality of the data gathered, one can see quite clearly the cash flow patterns of the traders in the informal market. Small denominations, high frequency. While every trader in the market may not be doing the same volume of business, there’s enough of a suggestion that there is a dynamic aspect of trade. 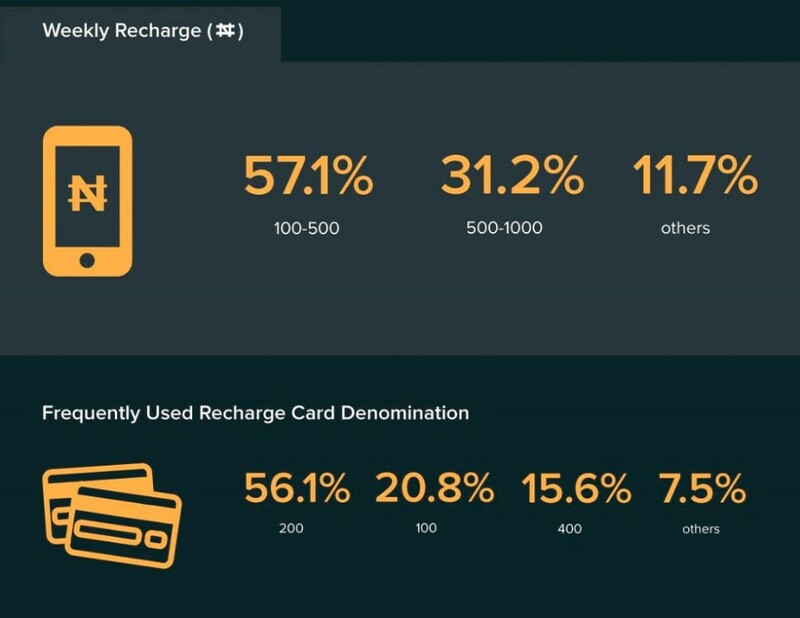 Its made visible by the not insignificant number of traders whose total weekly expenditure on airtime recharge is 10 or 20 times the denomination value of the recharge coupon. They are most definitely topping up more than once a day. And on the phone, “doing business”. Trade – in the informal economy sense of the word, not the formal container ships of industrialized goods – happens by negotiation, haggling, bargaining, brokering, mediating and communicating. Biashara, in this sense is a better word, for the marketplace as a bazaar, not a cathedral. Markets are conversations, to unearth a cliche, and the pattern of mobile phone use, coupled with the pattern of recharge, is an indicator of informal trade. The implications of these surveys validating a hypothesis are immensely useful for design planning for the informal market.